Like a lot of people, I grew up throwing sticks for my dogs to chase and I’ve done the same thing with Haley when hiking through the woods or playing on the beach. Throwing a stick for a dog seems like a natural thing to do and a lot of dogs like to chase and chew on sticks. Most people could live a lifetime with many dogs and never experience a problem from their dogs playing with sticks but if you ask your vet the question “Are sticks safe for dogs?” you’ll find out that it’s pretty common for dogs to become injured by them. Here are some things that can happen. 1. Dogs can impale themselves on a stick. This is probably the most common way that sticks can cause an injury, especially if the stick is thrown end over end. If the stick gets stuck in the ground in an upright or forward facing position, it can become a spear for a dog that’s running full speed towards it. A dog can pounce or fall on the stick or try to grab it while running and possibly impale the roof of their mouth or throat. Another risk is when a dog retrieves the stick and carries it from the end rather than the middle. They can easily impale themselves while running back to you if the end of the stick hits something like a tree or the ground, especially if they’re jumping over obstacles. 2. Chewed or swallowed pieces of wood can cause splinters and obstructions. Smaller pieces of wood or splinters can become lodged in a dog’s gumline or other areas of the mouth. If swallowed, those pieces can also cause potential problems such as obstructions in the respiratory or digestive system. It can be a challenge for vets to find small splinters or pieces of wood after removing a larger piece because those small, rogue splinters often don’t show up on X-rays and could cause an infection requiring a second surgery later. 3. Dogs can shear off pieces of a stick that can become wedged in their mouths. This is probably not as common, but it actually happened to Haley once. She likes to break sticks into pieces with her back molars. Those premolars are so efficient at shearing, she cut right through both sides of the stick and the piece left in her mouth became wedged between her top molars. In Haley’s case, I was able to reach in and remove the stick even though she was very frantic but I was lucky that she didn’t accidentally bite me in the process. Luckily, she was fine afterwards but sometimes a wedged piece of stick can cause injuries to the mouth. 4. Dogs can be injured by a falling stick. Some dogs run so fast that they can get to the fall zone well before the sticks lands. A falling stick can cause head and eye injuries as well as harm to other parts of the body. Even if you keep your dog in a stay position and wait to release her, the stick could still be lodged upright in the ground when your dog finds it. 5. Multiple dogs can injure each other while playing with sticks. Haley’s favorite play buddy was my parent’s dog, Penny. They loved chasing after sticks together when we would visit the farm. 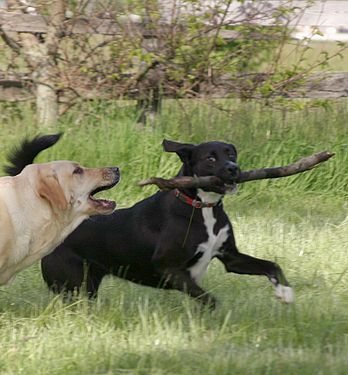 Neither ever got hurt while chasing and wrestling with all those sticks, but like this picture illustrates, one quick cut in the wrong direction while another dog is trying to grab the stick could result in an injury. It’s a good idea to avoid throwing sticks in areas like dog parks where several dogs are romping, wrestling and competing for toys. If your dog loves to retrieve sticks, consider switching to safer alternatives such as the Kong Safestix, a hunting dog bumper or one of the many toys on the market that are shaped like a stick but made of soft rubber. I like the Kong Safestix because it also makes a good tug-of-war toy. If you have a puppy or young dog that likes chewing on sticks, start early on preventing it from becoming a habit by replacing sticks with safer toys or bones. Also, regularly check your yard for any sticks that may have fallen out of trees. I have to admit, I’m somewhat on the fence with this topic because it seems like dogs and sticks go together as much as peanut butter and jelly. It also seems like every other article we read these days is about how dangerous something is. Yet, it’s important to know what the risks are especially if this is something you do often with your dog. Haley’s played with a lot of sticks in the past but now I’m thinking about switching to some safer alternatives. I’m really curious to know what you think. 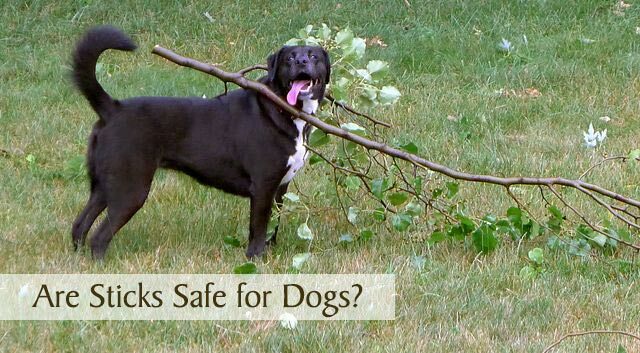 Are sticks safe for dogs? My dogs don’t play with sticks, and have never even shown an interest in them. I agree with all your points about them. They much prefer a fun toy! It’s nice you don’t have to worry about sticks with Earl and Ethel. There are so many different types of toys now too, I would imagine there’s something to satisfy every type of dog. Great post! Miley used to love sticks, so glad she grew out of that phase! I understand the risks, but sometimes nothing beats a stick. When playing with sticks, I choose which ones the dogs get and take it away when playtime is over. I know, Haley loves them and I’ve always picked short, thicker sticks that are less likely to cause trouble. Mostly she likes to retrieve them out of water too. Mr. N plays with sticks but he’s not really into fetching them. He likes stealing them from Sage and chewing on them but I don’t let him do that for too long. Thanks so much! That’s the biggest thing, just to be aware of the risks and keep a close eye on your dog. I know so many dogs who like to chew sticks. And yes, it can be dangerous for sure! Luckily my huskies only interest in sticks is when the little ones are throwing them in a game of fetch. Yeah, what seems more natural than a dog chewing on a stick, right? I never realized until recently just how many stick related injuries vets treat each year, so it’s something good to know and keep in mind if your dog loves sticks. You’re very welcome, Cathy. It’s something I’ve never thought that much about either with Haley until learning that these stick injuries are a lot more common than I realized. Kilo doesn’t seem to care much about sticks. He’s more of a toy dog. 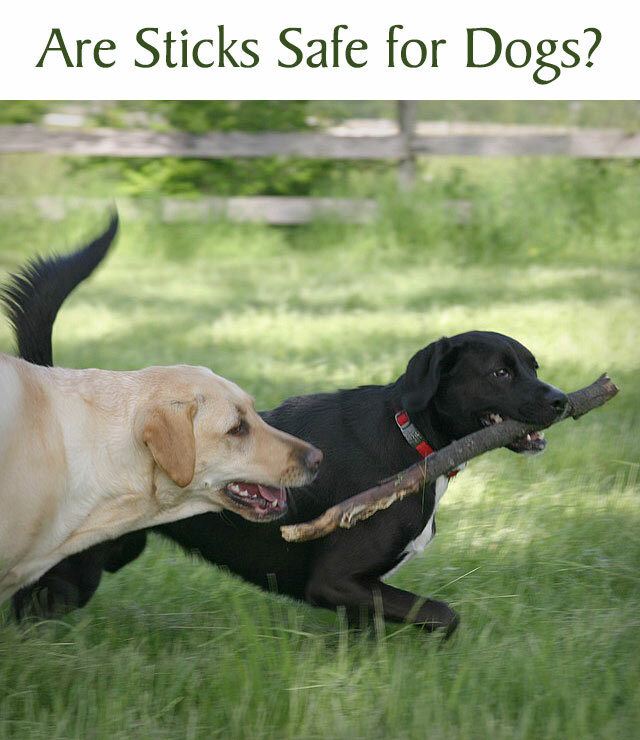 But great info in your post if you have a stick loving dog. Thank you! Haley always likes a good challenge but sometimes she gets in over her head, haha! I’m on the fence too. It’s probably only a few dogs seriously injured playing with sticks each year. But those post-surgical pics are horrifying. And knowing it’s a rare occurrence doesn’t make the person with the injured dog feel any better. That said, I will toss sticks for Honey. But we don’t toss them far. And we stub the edges against pavement to make them softer. And we break them into a reasonable size. I guess we try to decrease the hazards as much as possible. But don’t go crazy. That’s a good idea to smooth the edges and keep the sticks short. I also look for thicker sticks rather than the thinner and sharper ones. My friend’s bro is a vet and he had a dog come in once impaled on a stick (he was able to save it. Yay!) so I always make sure if Rita picks up a stick that she carries it the “right” way. She’s not a huge stick lover but she sometimes picks one up on a walk and carries it for a block. She has this one, though, that she fell in love with and carried it all the way home. She occasionally wants to play with it or chew on it, so I just keep an eye on her. That must have been a great find for Rita to carry it all the way home! I’m glad your friend’s brother was able to save the dog that got impaled, I can’t imagine how scary that must have been for the owners. Interesting points. Those are definitely some things to consider. Yeah, I’m not one to worry about every little thing that could happen, but it’s good to at least know the risks. I like chasing dog frisbees and balls. I only get to chase sticks when I go swimming somewhere. Several of my dogs love sticks. Thankfully there have been no injuries, but we do watch them closely, as with anything. 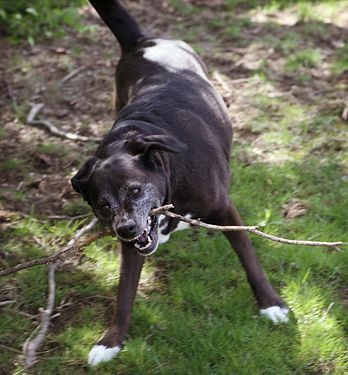 Most dogs do seem to love a good stick, whether it’s to chase them or chew on them. That’s probably a good idea. I’ve been wanting to make a wooly tug toy after seeing someone’s craft tutorial the other day. It looks easy to make and nice that you can throw them in the washing machine when they’re dirty. Thank you for posting this important information. I am guilty of using sticks as toys and always hope something doesn’t happen to them. Thanks also for adding a alternative to sticks. Thanks, JoAnn. I’m going to order some new toys for Haley soon and I’ve seen some great alternatives out there. I just hope she likes them as much as she loves her sticks, haha! I’m so glad you wrote about this; dogs are always picking up sticks & it’s not that often that I see people trying to discourage it. I certainly don’t use sticks anymore, but I shudder when I think of how many I used growing up with my dogs playing fetch… So glad nothing bad every happened. Thanks Jen, I kind of feel like the doom and gloom, safety monitor with this article, but after what happened to Haley and then hearing from vets about how common these injuries actually are, it’s at least good info to know. I would say no, stick are definitely not safe. That being said, I’ve thrown dozens, probably 100 sticks, for Ace over the years. I’m more careful about it now because I’ve read other blogs like this about the potential dangers. If we are at a park with no toy to throw, I will still pick up a stick and throw it a few times. I’m really careful and I’m aware of the potential dangers so I guess I’m taking that risk. Because of this, I try to always bring a toy along like a ball so there’s no temptation for me to throw a stick. Ace also likes to chew up sticks and swallows some of the little pieces. Obviously not ideal, like you said. I’m going to follow your advice, Lindsay and start taking a toy when we go hiking. It’s one more thing to carry, but Haley would probably like having it to chase or swim after and it would be a lot safer. I can’t imagine how horrible that would be if your dog got impaled on a stick and you were out in the middle of nowhere. Yes, supervising your dog can definitely eliminate a lot of the risk and like Pamela mentioned, being selective about what kinds of sticks you throw and even how you throw it can make a difference. I have to say, I’ve never had a stick get stuck upright in the ground when throwing it, but our soil is mostly hard packed clay around here. I was surprised that’s what causes most stick-related injuries to dogs. I’m guessing my dog is too obsessed with sticks at this point to change his ways. Living in the woods they are everywhere (and cheap)! If he had one of those fake sticks I sure he promptly lose it. At least with real sticks he can be on a walk and grab one, carry it for a while , drop it where ever, with no worries about it getting “lost”. I know the risk, but your post is a good reminder for all dog people. Haley’s pretty obsessed with sticks as well. It’s funny when she finds a good one that she wants to keep. She’ll carry it for awhile but usually never longer than 2 or 3 minutes. There have been a few good sticks I even brought home from a hike before. 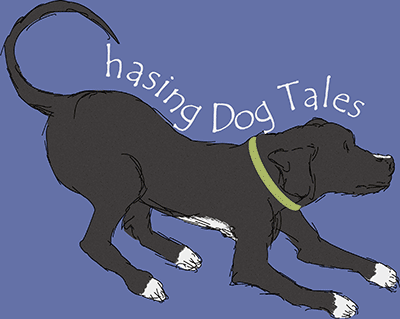 Ever since our Sally got a stick stuck in her mouth – crosswise – stuck between her teeth – I haven’t let our dogs play with sticks – too much room for injury. That type of scenario must be more common than what I thought since Sally, Dolly and Haley all had that happen to them. This is a great post. Many people don’t think about the dangers of sticks. While visiting with my parents in New England last week; their dog (a jack russell terrier) immediately went for a stick as this was a game he was use to playing, and of course wanted me to throw it. So instead what I looked for where dead plant stalks, not so easy to throw because they lack any weight but he got to run and chase them and I knew he would get hurt because they fall apart so easily. You right, we don’t think about the dangers and it is something I think we all did as kids with our dogs. I will definitely have to share this on my FaceBook page. Hi! This was very informative. Do you know if Monday Mischief Blog Hop is going on this week? Hi Terry, Thanks for stopping by and checking out the post. I’ve noticed the Monday Mischief Blog Hop usually starts somewhere between midnight and 1:00 am EST on Mondays, so you should be seeing it soon. I look forward to catching up with you on the hop this week! I occasionally throw sticks for the dogs if we’re playing at water and I don’t have a ball with me, but at home the dogs prefer balls anyway. Luke used to chew on sticks some when he was a puppy but he never really ran with them much. Now none of the dogs really show any interest if there’s any around the yard. I’m on the fence like you, our late Lab mix Maggie loved to play with sticks and we always let her (I’d avoid long sticks though since they could hit something with them when running too). It’s nice that your dogs prefer balls over sticks, that way you don’t have to worry about it that much. That’s probably the best idea to avoid injuries, pick short sticks. Toby doesn’t like chasing or chewing sticks anymore so it’s not a problem for us. You make a lot of good points about the dangers though.